Eleven years ago, Curt and Penny Scroggins started Bear Hardware in Nashville, Indiana. They purchased the store at 129 West Washington Str. in Morgantown as their first satellite venture. The location originally opened in 1882 as Mitchell Hardware, and has always been a hardware store. Regardless of ownership, the location has a reputation in the com – munity for offering exceptional service and supplies. Curt and Penny vow to continue that tradition. 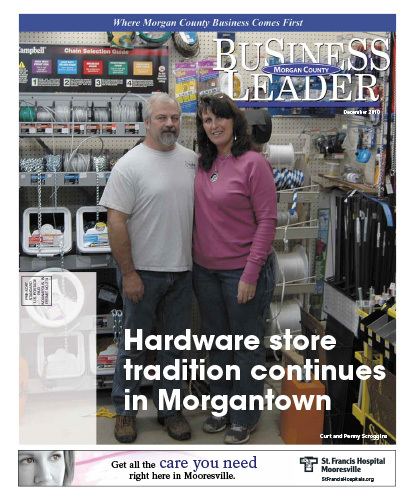 Curt adds, “The location changed ownership many times, but it’s always been a hardware store and it’s never been closed.” The Scroggins’s pur – chased the store from the Parsons family and took control in July without shutting the store. Instead, they update the inventory and make tiny reno – vations daily. Download the full December 2010 Edition here.